Cal-Mil 1155-13 Black One by One Three Tier Bread Display Case 9-1/2" x 14-1/2" x 19-3/4"
TigerChef > Browse by Store Type > Bakery Shop > Bakery Displays >< Bread Box Display Cases > Cal-Mil 1155-13 Black One by One Three Tier Bread Display Case 9-1/2" x 14-1/2" x 19-3/4"
$177.99 Cal-Mil 1155-74 Silver One by One Three Tier Bread Display Case 9-1/2" x 14-1/2" x 19-3/4"
$208.99 Cal-Mil 1146-13 Black One by One Four Drawer Bread Display Case 14" x 14-3/4" x 15-3/4"
$142.99 Cal-Mil 1471 Eco Modern Single Tier Merchandiser 21" x 13" x 8"
$84.99 Cal-Mil 1478 Eco Modern Acrylic Bin for 1471-SET Merchandiser 19" x 13" x 5"
$268.99 Cal-Mil 1279 Eco Modern Two Tier Bread Display Case 14" x 11-1/2" x 15"
$74.99 Cal-Mil 1480 Eco Modern Two Drawer Acrylic Bread Box for 1279 Bread Case 12" x 12" x 6"
$208.99 Cal-Mil 1146-74 Silver One by One Four Drawer Bread Display Case 14" x 14-3/4" x 15-3/4"
The Cal-Mil 1155-13 One by One Three Tier Black Bread Display Case - 9 1/2" x 14 1/4" x 19 3/4" is a versatile addition to bakeries, coffee shops, hotels and other food service establishments. This piece can be used to display breads, pastries and a variety of other baked foods. Featuring durable frosted acrylic walls, this display provides excellent visibility, so your customers or guests can quickly see what's available. The frame of this display case is constructed from metal for exceptional strength that will endure the rigors of commercial use. The frame has a beautiful black finish which will complement a variety of settings, making it an ideal option for buffet setups. 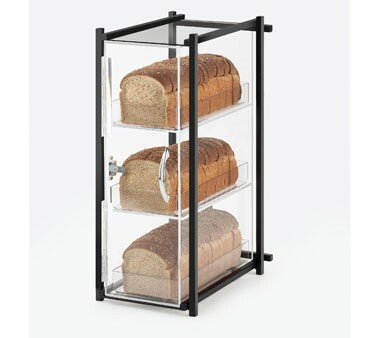 This bread display case comes with three removable and easy to clean bins.